Gripzo introduces a new kiosk stand with a universal security bracket on top for tablets. The Gripzo tablet bracket is suited for all tablet dimensions from 7” to 10” with standard grips and from 10 to 13” with XL grips. That means you can also secure the iPad Pro with our XL grip set. All Gripzo tablet holders offer a total lock and a quick release in 2 seconds. This keeps the tablets mobile. 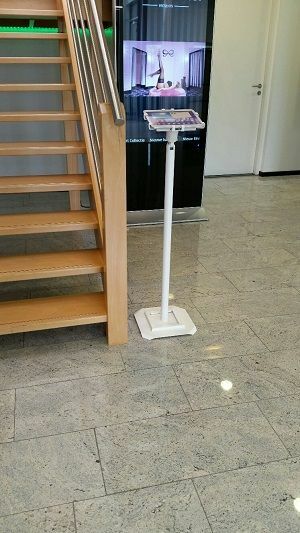 The tablet floor stand is 1 meter high (39.37 inch) and the viewing angle can be changed in four positions. The power cord can be integrated through the pole. Gripzo offers the kiosk stand with a mounting plate to mount the floor stand to the floor or with an add-on freestanding floorplate. The tablet floor stand is available in black, white or custom colours (MOQ 10 pcs).